Has your world been turned upside down by food allergies? If you’ve felt the anxiety of dining out with food allergies, or trying to make safe, delicious food for a party, this page is for you. One day, unexpectedly, your child had an allergic reaction to food. Maybe it was peanut butter, maybe it was eggs or dairy or wheat, but the point is, your world was turned upside down. The foods that you’re used to eating, the recipes you’re comfortable making? None of those are safe anymore. Not to mention the anxiety about attending parties, dining out, or traveling! How will you manage now that you’re dealing with food allergies? Take a deep breath. You can do this. One step at a time, you can do this. You will learn how to keep your child safe, and you will still be able to eat delicious food, and even have fun. What was the first thing you did when your child was diagnosed with food allergies? Did you go home and throw out any food that contained the allergen? Peanut butter – gone! Peanut butter cups, salad dressing that contained peanut oil, all thrown out. And then you may have paused. Or if you’re like me, you may have rewashed all your dishes, mopped the floor, and burned anything that even came close to touching a peanut. (Yep…I may have gone overboard). Sure, you can toss out the allergens, and scrub your kitchen down in your own home, but what about in restaurants? What about a party? What’s the best way to deal with these situations that used to seem harmless, but now seem scary? Those questions are what prompted me to put together the Food Allergy Parent’s Starter Kit. When you’ve been diagnosed with new allergies, you need a few things: support, safe and tasty recipes, and tips about how to manage real life situations. If you’ve ever wondered – like most food allergy parents – if there’s an easier way, a way without so much stress, you’ll soon see that there is. 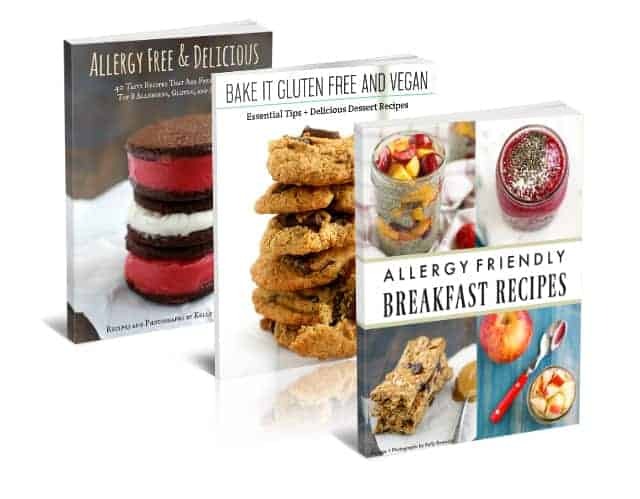 If you’ve ever wondered if there are tried and true recipes that are free of the top allergens – recipes that are truly delicious and taste “normal,” this is the collection for you. Can any guide take away all the challenges of food allergies? No, but it can make day-to-day living easier! 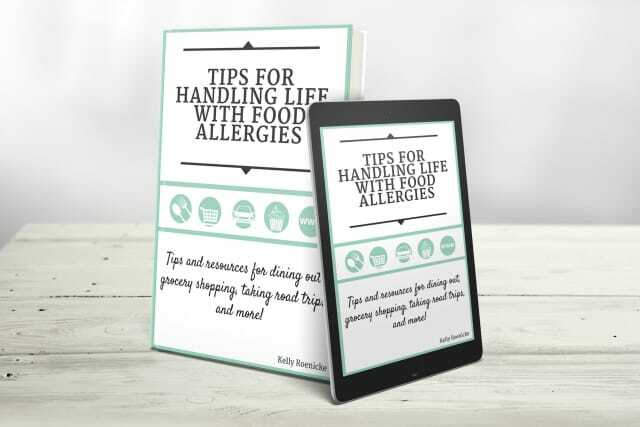 My name is Kelly Roenicke, and I’m a food allergy mom, home cook, and the author of multiple allergy friendly cookbooks. I know how frustrating it can be to deal with multiple food allergies. I’m passionate about helping parents learn how to create delicious, easy, safe food that their families will love eating. I believe that everyone should be able to enjoy wonderful meals even when they’re dealing with food allergies. When my son was diagnosed with allergies to egg, tree nuts, peanuts, and sesame, my world was forever changed. Products and recipes that we loved were no longer safe. I had to learn to cook and bake with all new recipes. The learning curve was steep, but we survived, and thrived, and you can, too! It takes a lot of time and effort to keep your family safe. When you’re new to the food allergy world, you spend a lot of time doing research. Researching safe brands, scouring the internet for safe, proven, tasty recipes, and trying to find out how to substitute safe ingredients in your family’s favorite recipes. You’ll save hours of your precious time with the Food Allergy Parent’s Starter Kit. 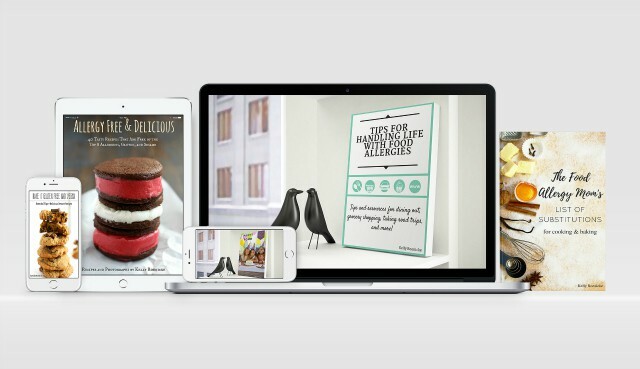 Recipes, tips, tricks, ideas for substitutions…it’s all in one place. Download the ebooks in the kit to your tablet or phone, and you’ll always have it with you. I’ve even included the contact information for many allergy friendly companies. You’ll have all the phone numbers and websites at the tip of your fingers. Proven recipes for breakfast, lunch, dinner, and dessert. Tips for dealing with parties and restaurants…it’s all here in this handy kit. Your time is valuable and precious. Why waste it searching through pages and pages of Google results? Start with the kit that contains the results you need in one place. If you were to buy each of these items separately, they would total $49.95, but when you purchase them together in this starter kit, the price is just $29.99. That’s a 40% savings! Download the Food Allergy Parent’s Survival Kit, read it, and if you don’t like it, email me and I will give you a complete refund. You have nothing to lose, and everything to gain! I’m taking a risk by offering this money back guarantee, but I’m confident that this kit is going to help you navigate life with food allergies. If you order the Food Allergy Parent’s Starter Kit today, you’ll also receive a free copy of my popular ebook, Allergy Friendly Breakfast Recipes ($9.99). Filled with tasty, easy breakfast recipes, this ebook is sure to help you get your mornings off on the right foot! Order The Food Allergy Parent’s Starter Kit now for just $29.99. 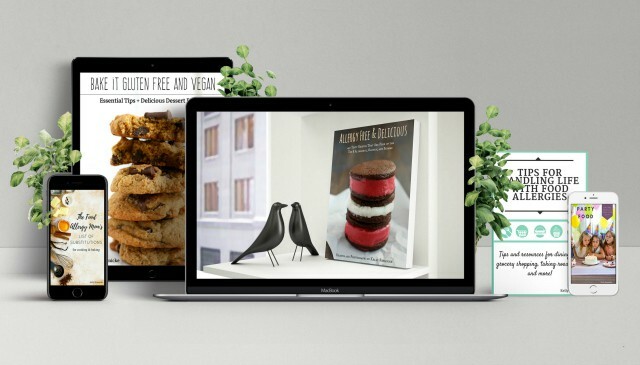 Once you order, you will be able to instantly download all of the ebooks in this helpful kit! If you prefer, you can even print the pages out, but these PDFs are easily read on your computer, phone, or tablet. You’ll be on your way to making delicious top 8 allergen free recipes that your family will love. Plus, you’ll learn how to handle parties, grocery shopping, dining out, and more! You can enjoy delicious, tasty recipes, even when dealing with multiple food allergies. Cooking and baking can be fun again! P.S. What are you waiting for? Save time and money order this kit today! This ebook collection is here to help you manage this journey. Click HERE to order now.